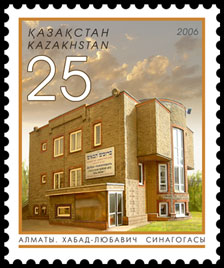 Chabad-Lubavitch synagogue in Almaty, depicted on a postal stamp from Kazakhstan. A Chabad-Lubavitch synagogue in Almaty is named after Rabbi Levi Yitzchak Schneerson, father of the Rebbe, who is buried at the city’s cemetery, close to the synagogue. Levi Yitzchak Schneerson was exiled to Kazakhstan from Ukraine, Dnepropetrovsk, where he was a chief rabbi. Lubavitcher Jews from all over the world come to pray at his grave. T he Jewish population data includes Mountain Jews, Georgian Jews, Bukharan Jews (or Central Asian Jews), Krymchaks (all per the 1959 Soviet census), and Tats. About 2,000 Jewish Kazakhs are Bukharian and Juhuro Mountain Jews. There are synagogues and large Jewish communities in Almaty where there are 1,000 Jews and in Astana and Pavlodar. There are smaller communities in Karaganda, Chimkent, Semey, Kokchetav, Dzhambul, Uralsk, Aktyubinsk, and Petropavlovsk. There are twenty Jewish Kazakh organizations, including the Mitzvah Association, Chabad-Lubavitch, the Joint Distribution Committee, Jewish Agency for Israel, and the All-Kazakhstan Jewish Congress (AKJC). The Jewish communities formed the AKJC in December 1999 in a ceremony attended by Kazakh government officials and United States Ambassador to Kazakhstan Richard Jones. There are fourteen Jewish day schools attended by more than 700 students. There is a Jewish kindergarten in Almaty. Between 2005 and 2006 attendance in religious services and education in Almaty among Jews greatly increased. The Kazakh government registered eight foreign rabbis and "Jewish missionaries" (see Jewish outreach.) It has also donated buildings and land for the building of new synagogues. The history of the Jews in Kyrgyzstan is linked directly to the history of the Bukharian Jews of Uzbekistan. Until the 20th century, most Jews living in the Kyrgyz areas were of the Bukharian Jewish community. However, during the 20th century, large amounts of European Jews began to emigrate to Kyrgyzstan which was then part of the Soviet Union, and a small amount of them still live in the country. Archeological findings suggests that Jewish traders from Khazaria started visiting the Kyrgyz territory around the 6th century CE. In Kyrgyz tradition, the term "Djeet" was used in order to describe Jews, and it is mentioned in the Kyrgyz epic poem Manas, which dates back to the 10th century CE. In Manas, several central-Asian cities are described as having Jewish communities in them, among them Samarkand, Bukhara and Baghdad, though non of them have ever been inhabited by a majority of Kyrgyz people nor included in a Kyrgyz territory. According to a census held in 1896, the Jews represented about 2% of the region total population. It can be assumed that almost 100% of these Jews were Bukharian Jews or at least Sephardic Jews, meaning no Ashkenazi Jews were living in the Kyrgyz area before the 20th century. During World War II many Jews fled from the European parts of the Soviet Union to central Asia, including Kyrgyzstan, making the Jewish community of Kyrgyzstan combined out of an Ashkenazi community and a Bukharian Sephardic one. The two communities functioned separately and though it did occasionally happen, Ashkenazi–Sephardi intermarriages were not common. Bukharan Jews, also known as "Bukharian Jews" or "Bukhari Jews" are Jews from Central Asia who speak Bukhori, a dialect of the Tajik language. Their name comes from the former Central Asian Emirate of Bukhara, which once had a sizable Jewish community. Since the dissolution of the Soviet Union, the great majority have emigrated to Israel and to the United States, while others have emigrated to Europe or Australia. In his memoirs, Marco Polo mentions the existence of Jewish traders along the silk road which passed through modern day Kyrgyzstan, who built synagogues and spoke Aramaic. Famous Arab geographer Al-Maqdisi (946−1000) mentioned the cities of Osh, Uzgen, Taraz and others as having communities of Jews. Ashkenazi Jews first arrived to Kyrgyzstan with its conquest by the Russians. In the city of Karakol, one Jew was recorded in 1885. By 1900 there were seven Jews in the city and by 1910 the city had 31 Jewish inhabitants. While in 1885 Bishkek had eight Jews, by 1913 there were 43 Jews in Bishkek. The city of Osh had the biggest amound of Jews in Kyrgyzstan prior to the 20th century, due to its Sephardic Jewish community, which even had its own Jewish cemetery outside the city. During the beginning of the 20th century, numerous Jewish Businessmen owned businesses in the Kyrgyz area − among them Yuri Davidov, who owned cotton factories in the Fergana valley, Boris Kagan who established a network of bookshops, and the Polyakov brothers who founded a branch of the "Azov-don commercial bank". Due to the need in doctors, teachers and engineers, many Ashkenazi Jews began to emigrate to Kyrgyzstan from European Russia. It is known that the Jewish community of Osh bought its Torah scrolls from its neighboring community of Uzbek Bukhara. Until 1915, there were no synagogues in Kyrgyzstan. 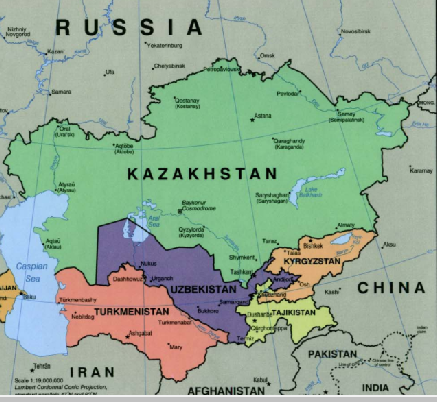 The nearest one was in Vernyi, nowadays Almaty in Kazakhstan, Tashkent, Samarkand and Fergana in Uzbekistan. A separate Jewish cemetery operated only in Osh, while in all other cities Jews were buried in separate areas of the general Muslim/Christian cemeteries. While there was no Jewish education in Kyrgyzstan, some of the Sephardic Jews in Osh sent their children to learn at the Heder in Samarkand. Ashkenazi Jews did not practice Judaism publicly, and sent their children to Russian schools. After World War I, more and more Ashkenazi Jews came to Kyrgyzstan. Among them many representatives of different political parties who were exiled to central Asia, or government officials who were asked to work in rural areas such as Kyrgyzstan. With the break of the Community revolution, many political activists were sent to Kyrgyzstan to promote the communist ideas − many of whom were Jews or of Jewish origin, such as G. Broido who was chairman of the Bishkek city soviet, and Pinchasov, Lifschitz and Frei who were members of the local city soviets of Osh, Djahlal-Abad, and Tokmak. In 1920 the local ministry of education initiated a Jewish institute run by Simon Dimanshtein meant for alphabetization of Sephardic Jews. In 1929, Alexander Volodarsky, a former Yeshiva student from Vitebsk, became the leader of the Ashkenazi Jewish community of Osh, after being exiled from Belarus due to his religious practices. During the Second World War, more than 20,000 Ashkenazi Jews fled to Kyrgyzstan from the Nazi-occupied western parts of the Soviet Union. The Jewish Theater Company of Warsaw with the renowned actress Ida Kaminska (1899−1980) was evacuated to Bishkek until it was moved back to Europe after the war. During that time, the theater performed in Bishkek in Yiddish and Russian. By 1945, some 70 Jews of the Bishkek community visited the local synagogue daily. On holidays, some 2,500[clarification needed] Jews visited the synagogue. Later, the synagogue began to host also Sephardic prayers for the city's Sephardi community. During the 1950s, the Jewish community of Bishkek reached about 3% of the total population of the city. Jews became dominant in the local university, clinics and schools, living mostly at the center of Bishkek. On other cities, smaller communities of Jews had lived also in the center mostly. During the 1970s, some Jews began to emigrate to Israel, though the Soviet government made it hard for them to emigrate. Later on, and especially from 1989 and on, the vast majority of the Kirgyzstan Jewish community emigrated to Israel, leaving around 500 Jews living nowadays in the country. In 2000, a rabbi was sent by the Chabad movement to the Jewish community of Bishkek, and nowadays there is a Jewish day school named "Pri Etz-Chaim", teaching some Hebrew and Jewish texts. The community is characterised by inter-religious marriage, and secular practice. Jewish graves can be found at the Bishkek old and new cemeteries, in specific sections. Local cemetery workers usually know about these areas. In Djhalal-abad, at the local cemetery, Jewish graves are scattered all around the cemetery, marked usually by the Magen David sign. The Mongolian Jews date back to the 19th century trade routes between Siberian-Jewish merchants and the Mongolians. This resulted in some Jewish families entering Mongolia. Before 1920, most Jews that arrived in Mongolia were of Russian background, and had fled the chaos of the Russian Civil War. Some were even elevated to mongolian nobility as was the case of Zanzer who changed his name in honour of Zanabazar, the first Bogd Khan. Unfortunately, the community was deported from the country after 1921. In 1925-6, a Russian-Jewish journalist came across a community of 50 newly settled families in a remote region of Outer Mongolia approximately 200 miles from the Manchurian border. In 1926, Ulan Bator had a population of 600 Russian Jews who had attempted to leave Outer Mongolia, which was a Soviet satellite at the time. A number of Jewish citizens left the country in search of better economic opportunities. Some left for Israel, which had a visa agreement with Mongolia. Many Israeli tourists visit Mongolia each summer. Despite that, the Jewish population numbers less than 100. The closest Jewish community with a rabbi is the Siberian city of Irkutsk, whose Chief Rabbi Aharon Wagner wants to maintain close contact with the neighboring Mongolian Jewish community. THE JEWISH COMMUNITY IS OFFICIALLY REGISTERED IN MONGOLIA. The Mongolian Jewish community was officially registered a few days ago. A Mongolian Jew seems to be as rare species as "a Jew-deer breeder", once mentioned by the late General Lebed. Nevertheless, during the past 800 years, the Jewish community has emerged on three occasions. First time it happened during the rule of the "Shaker of the Universe"- Ghinges Khan and his sons, when the empire's capital Karakorum, which they built, was populated by various nationalities, including Jews. Unfortunately, there is almost no information available on that community, which disappeared without a trace in the 14th century, after the Mongol empire had collapsed and Karakoum had been devastated. Second Jewish community emerged in Mongolia at the end of the 19th century. Those were almost all Russian Jews living in Urga (then, the name of the Mongol capital Ulan Bator). The ending was not a happy one for that community either. Having taken Ugra by storm in the beginning of 1921, the semi-crazy baron Ungern von Sternberg inflicted a cruel Jewish pogrom. Von Sternberg was shortly followed by the representative of the local Soviet authorities. It seemed as if the Jews were to wait for yet another seven centuries to see the community reemerge. THE HISTORY OF THE JEWS IN TAJIKISTAN. Jews and Judaism in Tajikistan have a long and varied history. Many of the Tajik Jews were originally Bukharan Jews. Jews first arrived in the eastern part of the Emirate of Bukhara, in what is today Tajikistan, in the 2nd century BC. After the Communists came to power they organized the country into republics, including Tajikistan, which was first formed as an autonomous republic within Uzbekistan in 1924, and in 1929 became a full-fledged republic. In an effort to develop Tajikistan, Soviet authorities encouraged migration, including thousands of Jews from neighboring Uzbekistan. Most Jews settled in Dushanbe, the capital of Tajikistan, where they opened the Dushanbe synagogue. During World War II, a second wave of Ashkenazic Jews migrated to Tajikistan. In the Soviet Union, including Tajikistan, beginning in the 1970s, Jews who were able, began to emigrate to Israel, as well as to the United States. By the late 1980s, many of Tajikistan's Jews had left. After the dissolution of the Soviet Union in 1991, Tajikistan gained independence and the country fell into a state of civil war between the government and Islamist forces. Continuous military conflict kept Tajik Jews in severe poverty and in fear for their lives. In 1992-1993 most of the country's Jews were evacuated to Israel or the US. Between 1989 and 2000, a total of 10,800 out of the country's 20,000 Jews immigrated to Israel alone. Those Jews who emigrated were stripped of their Tajik citizenship and no longer hold a connection to the country. Today, only a hundred Jews are left in Tajikistan. Approximately 40% are Bukharan, and the rest Ashkenazi. They are mostly elderly, poor, and subjected to Antisemitic attacks and persecution. One tragic event in the community was the murder of journalist Meirkhaim Gavrielov. The Jewish community is barely able to function, and relies on aid from world Jewish organizations to survive. The majority of the country's Jews live in Dushanbe, with smaller communities in Shakhrisabz (In Uzbekistan), Leninabad Oblast, and the Fergana Valley. Tajikistan's Jewish population was almost non-existent in 1926, and it increased rapidly between 1926 and 1970. In 1970, Tajikistan's Jewish population was over fifty times larger than it was in 1926, numbering almost fifteen thousand people. Tajikistan's Jewish population continued growing between 1970 and 1989, but at a much slower rate. Since the collapse of Communism virtually all of the Jews in Tajikistan left and moved to other countries between 1989 and 2002. Most of the Tajik Jews who emigrated moved to Israel. The Jewish population data includes Mountain Jews, Georgian Jews, Bukharan Jews (or Central Asian Jews), Krymchaks (all per the 1959 Soviet census), and Tats. As of 2006, the Dushanbe synagogue was the last remaining synagogue in the country, and was actively being used for worship. However, the Tajik government ordered the local Jewish community to vacate the synagogue, which was going to be demolished for a new presidential palace. After the destruction of the community's mikvah, kosher butcher, and several classrooms in February 2006, the demolition was temporarily halted due to protests from the Israeli and US embassies, as well as from worldwide world Jewish communities. The synagogue was finally razed by municipal court order in the end of June 2008, and the community was allocated a site in the western part of Dushanbe to build a new synagogue with financing from international Jewish organizations and private donors. Because of this incident, many Israelis and Americans of Tajik Jewish descent have negative views toward the Government of Tajikistan. 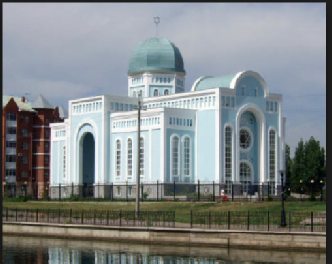 The new synagogue of Dushanbe was opened on 4 May 2009 in an existing building donated for this purpose by Hasan Assadullozoda, a Tajikistani businessman and the brother-in-law of President Emomalii Rakhmon. The opening ceremony was attended by U.S. Ambassador Tracey Ann Jacobson, Tajik Deputy Culture Minister Mavlon Mukhtorov, and Imam Habibullo Azamkhonov. THE HISTORY OF THE JEWS IN UZBEKISTAN. Uzbek Jews have two distinct communities; the more religious and traditional Bukharan Jewish community and the more progressive, Europe extracted Ashkenazi community. There were 94,900 Jews in Uzbekistan in 1989, but fewer than 5,000 remained in 2007 (most of them in Tashkent). There are 12 synagogues in Uzbekistan. Most Uzbek Jews are now Ashkenazi due to the immigration of Bukharian Jews to Israel and the United States. Semyon Abdurakhmanov is the head of the Fergana Jewish community. There are six synagogues in the Valley. There are several hundred Jews in Fergana, Namangan, and Kokand, with about 800 total in the area. Abdurakhmanov has said that the biggest problem faced by the Jewish Uzbek community is the economy. During the Andijan Massacre in May 2005, the Israeli Embassy in Tashkent asked Abdurakhmanov to make a lists of Jews "in case there will be a need to airlift people to Israel." The Jewish population of Uzbekistan (then known as the Uzbek SSR) nearly tripled between 1926 and 1970, then slowly declined between 1970 and 1989, followed by a much more rapid decline since 1989, when the collapse of Communism began to occur. Between 1989 and 2002, over ninety percent of Uzbekistan's Jewish population left Uzbekistan and moved to other countries, mostly to Israel. Uzbek Jews have two distinct communities; the more religious and traditional Bukharan Jewish community and the more progressive, Europe extracted Ashkenazi community. There were 94,900 Jews in Uzbekistan in 1989. Most Uzbek Jews are now Ashkenazi due to the immigration of Bukharian Jews to Israel and the United States. 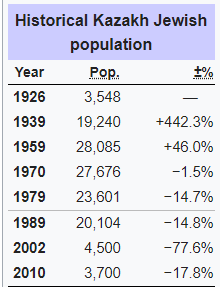 The Jewish population of Uzbekistan (then known as the Uzbek SSR) nearly tripled between 1926 and 1970, then slowly declined between 1970 and 1989, followed by a much more rapid decline since 1989, when the collapse of Communism began to occur. Between 1989 and 2002, over ninety percent of Uzbekistan's Jewish population left Uzbekistan and moved to other countries, mostly to Israel.